Eyelashes are curved across the baby's eyelid so Curved Micro Point Scissors will help you accurately trim your baby doll's eyelashes. Trimming delicate hand rooted eyelashes can be a daunting task since one wrong nip can ruin your well placed hairs. With the delicate curve, our Micro Point Scissors you can accurately and perfectly trim your baby doll's eyelashes without worry and get the exact results you want! 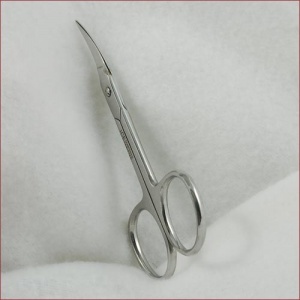 These little scissors also work well to trim threaded eyelashes that are too long for your doll. Good for left or right handed use and will fit comfortably in most hands. The tiny cutting blades are razor sharp so keep them away from children. These shears also work well for rooted eyebrows and rooted hair on miniature reborn dolls.